BATTLE CREEK, Mich., Nov. 5, 2018 /PRNewswire/ -- Last Thanksgiving, Pringles® showed the world they deserve a seat at the table when they launched the Pringles Thanksgiving Dinner. The limited time only offering gave snackers the chance to taste eight new innovative, Thanksgiving-inspired flavors. This year, Pringles is upping the ante and giving fans a chance to get their hands on a can (or three) of favorites from last year's lineup: Turkey, Stuffing, and Pumpkin Pie. 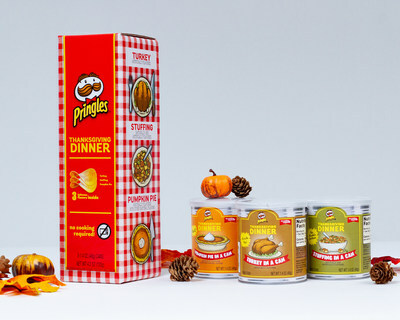 Pringles, known for their insanely accurate and innovative flavors, is offering three delicious Thanksgiving tastes to select consumers nationwide. Turkey Pringles are a take on the traditional oven roasted turkey flavor, which instantly became one of last year's favorites. Stuffing is just like the herb-y side dish that you always seem to pile high on your dinner plate. Last, and by no means least, Pumpkin Pie is sweet and spiced just like your grandma's recipe. 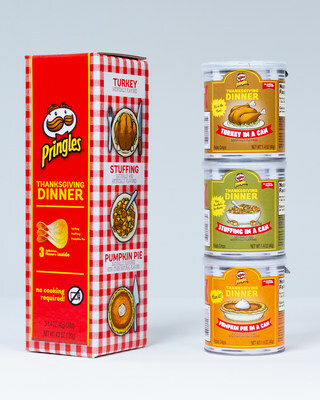 "When we launched Pringles Thanksgiving Dinner last year, it was so exciting to see Pringles fans' positive reactions celebrating how insanely accurate the flavors were," said Yuvraj Arora, senior vice president of marketing for Kellogg's U.S. Snacks division. "We knew that we had to get Pringles Thanksgiving flavors in more people's hands this year—particularly hearing that Turkey, Stuffing and Pumpkin Pie not only were delicious, but truly tasted like the real deal." Beginning November 6 at 11:59 pm EST, consumers can purchase a 3-pack of Pringles Thanksgiving crisps for $14.99 at https://www.kelloggstore.com/pringles-thanksgiving-in-a-can. Supplies are limited and are on a first-come, first-serve basis. For more information follow @PringlesUS on Instagram and check out Facebook.com/Pringles.